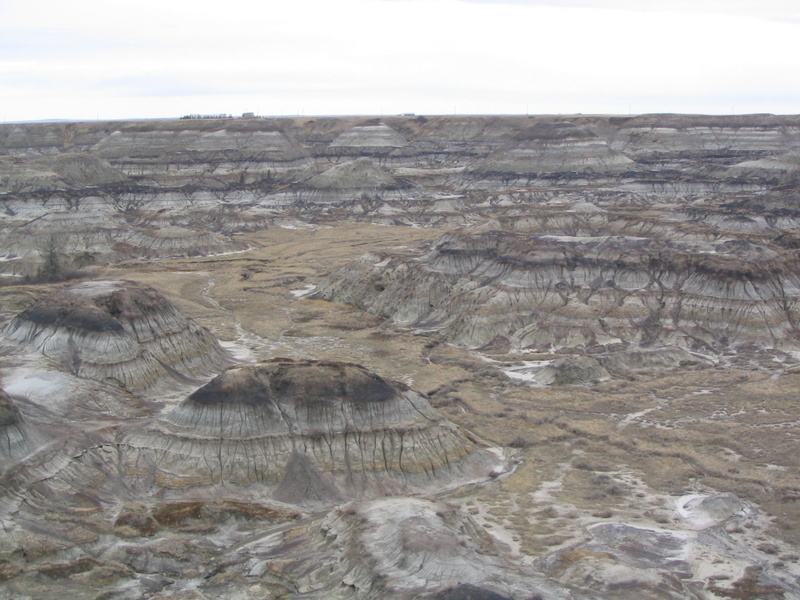 Take a step back into a prehistoric time when dinosaurs roamed the earth and you are in the badlands of Drumheller. Visiting the badlands will provide opportunities to explore a coal mine, walk across a suspension bridge and learn about dinosaurs at the Royal Tyrrell Museum. The landscape of Drumheller is like no other in Alberta and includes hoodoos, coulees, canyons and more. When my husband and I went to Drumheller, it was a short trip (only two days) and we stayed at a Bed and Breakfast in town instead of camping. In those two short days we packed in so much of what Drumheller had to offer, and still we did not see it all! To start off our weekend trip, we came face-to-face with a Tyrannosaurus Rex skull, among many other prehistoric creatures’ skeletons, at the Royal Tyrrell Museum. 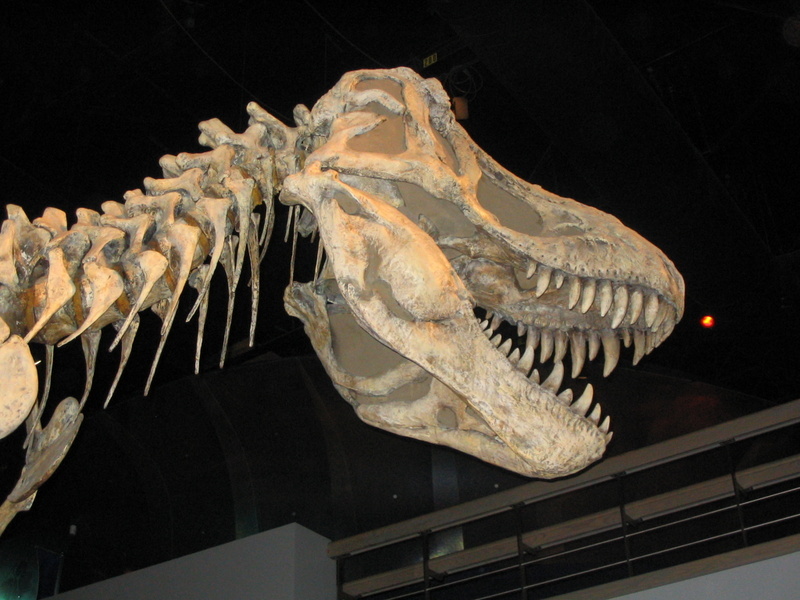 The museum is located just 6 kilometres northwest of Drumheller and is Canada’s world-renowned paleontology museum. We used an entire day to explore the museum as it is massive and provides information on dinosaur bones, dig sites, fossils and paleontology. Our second day in Drumheller consisted of sightseeing and some driving adventures. We explored the hoodoos down Hoodoo Trail. Hoodoos can be found all over Drumheller area, but there are some hoodoos that are protected that you can get really close to take pictures of; however, you cannot touch them as they are very fragile. These interesting rock formations are basically sand pillars that have been eroded into shapes by wind and water, with a harder stone top cap. They really are a sight to see and I could not get enough of them! 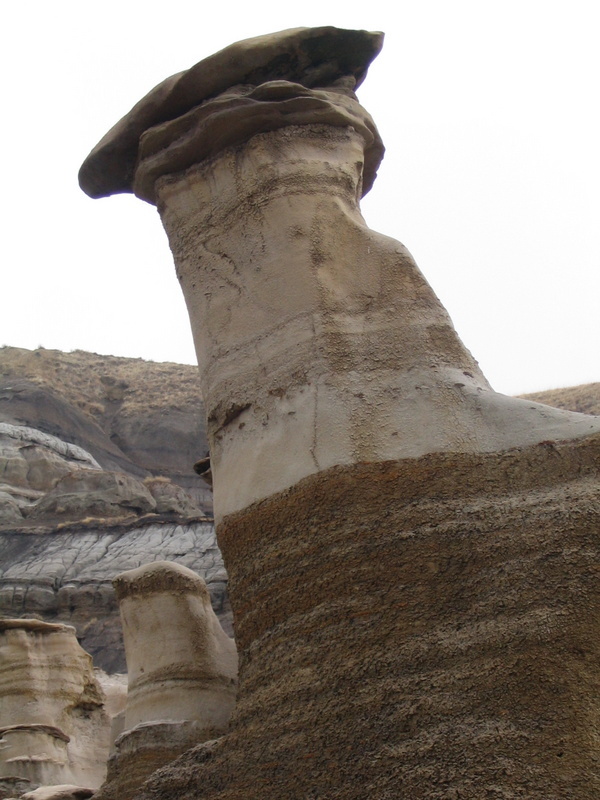 You can get a close-up of the hoodoos, but please don’t touch these fragile structures! After the hoodoos, we kept driving southeast of Drumheller, to the small village of Wayne, Alberta. To get here you take a windy road and cross eleven, one lane, wood plank bridges; truly a neat drive. 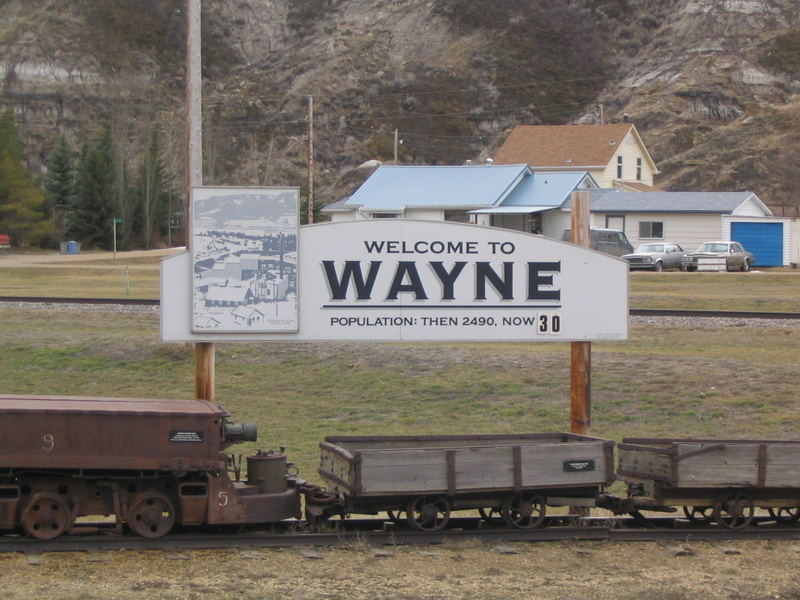 Once you have completed your driving adventure you arrive in Wayne, population 30, and can enjoy a burger and a beer at the Last Chance Saloon. It was evening for us, so we called it a day and headed back into town to our Bed and Breakfast. On our way home on the last day, we stopped in to see the amazing view at Dry Island Buffalo Jump. This is where it looks as though the terrain of the badlands goes on forever and ever; you can see for what seems like miles. It is a historical site because the Plains Indians drove buffalo over the edge to their deaths in order to provide food for their people. It is also here at Dry Island Buffalo Jump where the bones of Albertosauraus were discovered, and you can view these remains at the Royal Tyrrell Museum. With lots of history and a great view, it is the perfect end to an interesting, prehistoric trip. A few other attractions that we didn’t have time to take part in include exploring the Atlas Coal Mine Historical Site, walking across the Rosedale Suspension Bridge or hiking Horsethief Canyon. Drumheller is a small area but we definitely needed more than a weekend to be able to enjoy everything it has to offer; therefore we will be back and this time we will check out the camping accommodations!